The T550 (UC50…) can be used as a non-calibrated calculator (acc. EN 1434) for determination of heat-/cold flow volume of liquid mixtures (e.g. glycol/ water). On this order option density and enthalpy correction are in progress analog to water for a defined liquid mixture. A customer specific adjustment can be done easily with the service software locally. Alternatively the calculator can be used with battery (standard) or power supply unit. Independently the calculator detects which type of power supply is used and switches automatically to the corresponding temperature measuring cycles from 30 sec to 4 sec (if main supply is used). The life-time of battery is displayed on the faceplate of the calculator with a new symbol. 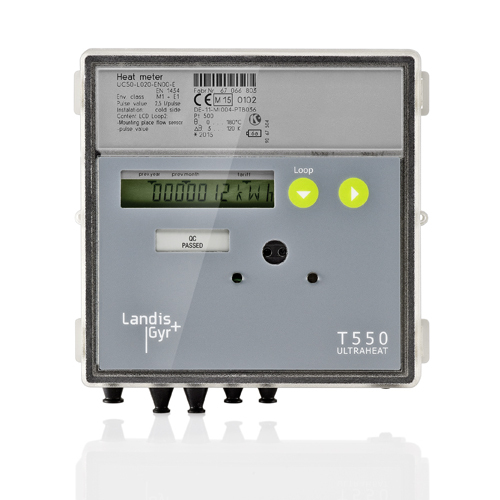 Comparable to the T550 (UH50…) the super cap in mains modules bridges power failure up to 20 minutes.